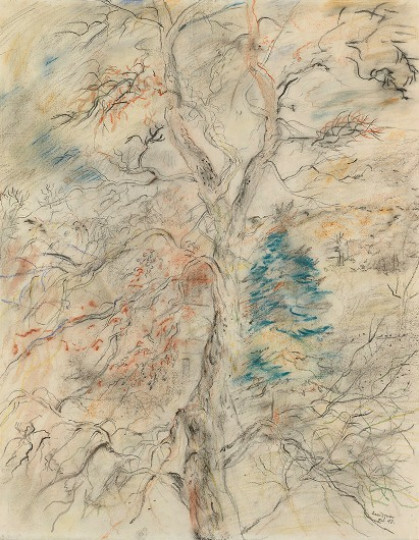 As in the sketch Brief Record of a Bird on a Bough, this drawing has a freshness partly due to David Jones’ use of pastel, a soft, powdery medium that cannot support being erased and worked over to the extent of pencil. The tree is viewed from below, from midway up the trunk, with its branches spread out, as if exceeding the perimeters of the paper. Dabs of yellow and umber between the branches hint at a few autumn leaves still clinging on, and these are intermingled with dabs of blue for sky. The spaces left all around for the bare paper to show through augment a sense of breeziness. A church dignitary once said to Lord Tennyson, with reference to a certain poem “Do these figures symbolize Faith, Hope and Charity?” to which Tennyson replied “They do and they don’t and I don’t like being tied down!” or words to that effect. It’s very much like that in painting or any work of art, I think. So many confluent ideas are involved in a single image. A drawing medium of dried paste made of ground pigments and a water-based binder that is manufactured in crayon form. The term also refers to a picture or sketch drawn with this type of crayon.